I would sell my house, car and kidney just for a chance to drive the 1989 Batmobile much less own it. Now it's possible for someone to own the next best thing. 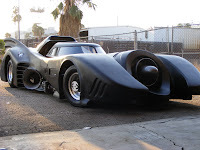 Kruse International is selling "exact recreation of the 1989 batmobile". The car is true to the movie in every way from its flame throwing afterburner to the 50 cal machine guns, alumn side intakes, grills, steel front turbine, alumn afterburner and real side mechanics... it has a canopy that moves under its own actuator to the correct wheels and Mickey Thompson tires. The Batmobile will be up for auction on Friday, March 20th and Saturday, March 21st at the South Point Hotel and Casino in Las Vegas, so if I'm gone this weekend you'll know why. That is unbelievable cool. They had me at flame-throwing afterburner.